Being a multiethnic city, the Winter Olympics host is home to a multitude of Russian Orthodox, Armenian and Catholic churches. The main Orthodox church of the whole Chernomorsky Region is St. Michael’s Cathedral on Ordzhonikidze Street. It was erected in 1890 in commemoration of the end of the Caucasian War. Now, the church’s structure is under the government’s protection as a monument of religious architecture. A church built in true Russian style—a wooden structure—is in one of the city’s residential areas. The Church of St. Andrew First Called was built in 1999 at the expense of the Kuban Cossacks. It houses a notable icon that people make pilgrimages to: the Holy Mother of God icon. It is said that praying to this icon can produce miracles—it allegedly cures those suffering from cancer. The most beautiful and striking cathedral in the city stands on Vinogradnaya Street. The Church of St. Vladimir was the first monolithic church in Russia and Europe. The first liturgy in the cathedral occurred in July 2008, on Prince Vladimir’s name day and 1,020 years after the Baptism of Rus. Because construction was funded by private donations, it advanced slowly. However, the result is astounding. The church is multicolored with an abundance of decorative details and ornamentation. A single iconostasis is invaluable—several kilograms of gold leaf cover it. One of the city’s oldest cathedrals, the Church of the Holy Transfiguration of Our Lord, is in the village of Khosta. It was built in 1914 on the model of Jerusalem’s Church of the Holy Sepulcher with donations from humble city dwellers. The last Russian tsar, Nicholas II, contributed 4,000 gold rubles to its building costs. After the 1917 Revolution, the church was shut and became a telephone exchange. In 2001, the church was reopened for worshippers. Now it holds icons that are around 200 years old and a relic brought from Greece: a slipper of the wonderworker Spyridon, Bishop of Trimythous. Today, his incorrupt earthly remains can be found on the island of Corfu. According to Orthodox belief, the saint continues to travel the globe helping people. Consequently, he wears out his velvet slippers, which workers must change every year: they put new ones on the remains and send the old ones to Orthodox churches around the world. An authentic church with a painted stone enclosure is located in the village of Nizhny Solokh-Aul and is part of the Hermitage of the Holy Cross monastery. It was established in 2000 in honor of the Exaltation of the Life-Giving Holy Cross. Construction is still in progress: the monastery sits on a remote mountainous site to which it is difficult to transport the building equipment, and the monks have limited means—they are funded only by donations. The monastery’s site was chosen deliberately: holy springs are found nearby. The local people say that the water in them is magical; curing sick people and giving strength to healthy ones. Can Sochi become a world-class resort after the Olympics? 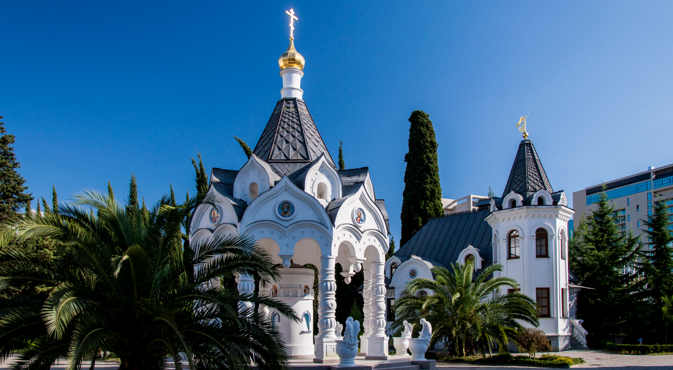 Sochi is a multinational city, and it is also home to non-Russian churches. For example, in Adler, next to Bestuzhev Park, stands St. Sarkis Cathedral, which belongs to the North Caucasus eparchy of the Armenian Apostolic Church. The only similarity to Russian churches is the cross on the roof. On the whole, the building looks completely different: there are subdued sandy tones, precise lines, ascetic cubism, triangular windows and a descending cascade of roofs. A Roman Catholic parish for followers of that religion has opened in central Sochi, on Parallelnaya Street. The Saints Simon and Jude the Apostles Church appeared relatively recently in the city, in 1997. Before that, there was only a small Catholic chapel that had been built under the auspices of the Polish national cultural center. The chapel held carved crucifixes, an organ and a small stained-glass window. Now all of this belongs to the cathedral, which was built in the neo-Gothic style. It is one of the largest and most popular churches among worshippers in the Krasnodar Region. The church’s altar is dedicated to the holy apostles, who preached in the Caucasus. In the center of the village of Krasnaya Polyana there is the Greek Church of St. Kharlampy. It was built in the late 19th century, but in 1937, like many churches in the Soviet Union, it was destroyed. The restoration work lasted many years; a plan was developed and agreed on, donations were collected and in 2003 the church was re-opened. It is practically an exact reproduction of the destroyed building. On religious holidays it is a gathering place for Russians of Greek extraction, who comprise a significant portion of Krasnaya Polyana’s local population. The most “Olympic” church in Sochi is in the Imeretinskaya Valley: it is the Church of the Acheiropaeic Image of Christ the Savior. A grandiose and majestic structure, it was built especially for the Olympics in order to acquaint athletes and foreign visitors with Russian Orthodox culture and architecture. In August 2012 the first stone was laid, and the construction started . . . or continued. According to Sochi historians, in the 9th and 10th centuries, before the Baptism of Rus, an old Byzantine church occupied this location. Human remains and building fragments bear witness to this. One of these fragments became a cornerstone of the church complex: a piece of the old Byzantine church was placed in the foundation of the new one. Religious services are now held here, along with theological scholarly conferences and spiritual lectures. The church’s arch is decorated with an icon that shows the Saviour surrounded by seraphim. The church’s area is 200 square meters. P.S. All houses of worship, no matter what the faith, are governed by particular standards of behaviour. In Russia, as in other countries, smoking, drinking alcohol, speaking loudly and laughing are prohibited in churches. Try not to visit a church in athletic clothing. Women are forbidden to enter a church in slacks or short skirts. In addition, before entering the building, women must cover their heads with a kerchief, so be sure to carry a small scarf or kerchief with you. If you forget to, ask the workers at the church. Churches usually lend out free kerchiefs for this purpose. When entering an Orthodox church, men must remove headwear.